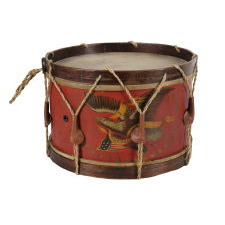 This beautiful Civil War drum has a vivid, scarlet red shell, on which an American eagle is painted with fine detail. The bird is perched in an aggressive fashion upon a patriotic shield that rests horizontally across the barrel of a cannon. A billowing streamer, gripped in the beak, reads "E Pluribus Unum" (out of many, one), and the image is encircled by an ellipse of gilt-painted stars. 32 of these are visible, with the wings of the bird covering the spots where two more would logically be placed. A count of 34 stars reflects the opening two years of the Civil War, 1861-63, when there were 34 states in the Union. 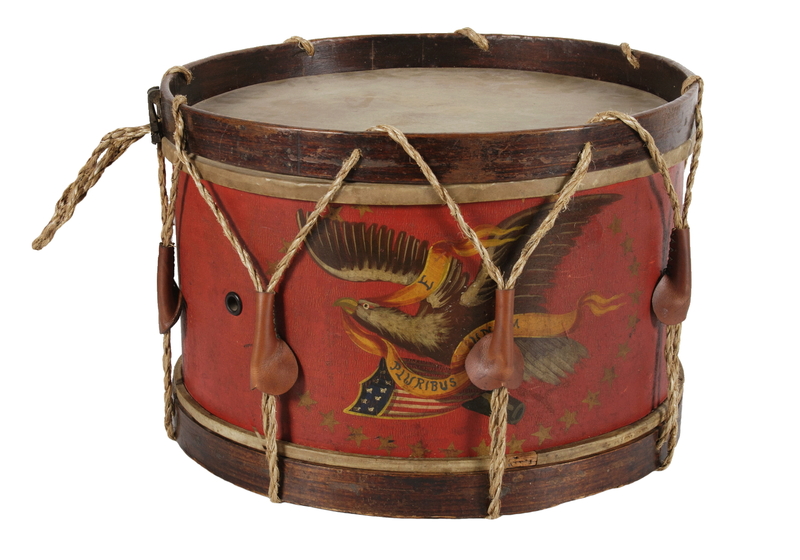 The design of the eagle is consistent with those seen on many other war-manufactured drums, as well as other objects of the Civil War period and the absence of olive branches is a further mark of wartime production. The color red indicates an artillery association (a blue ground denoted infantry) and the presence of a cannon supports the fact that this was indeed produced with the intent that it be issued to an artillery unit. John C. Hayes & Co. Condition: There is minor wear to the painting and gilding, which are original. Most Civil War snare drums were shortened in height following the war, and continued to be used. This one is no exception and is modified to an expected scale. The snares are absent. The bottom skin is broken. The ropes and ears were restored.